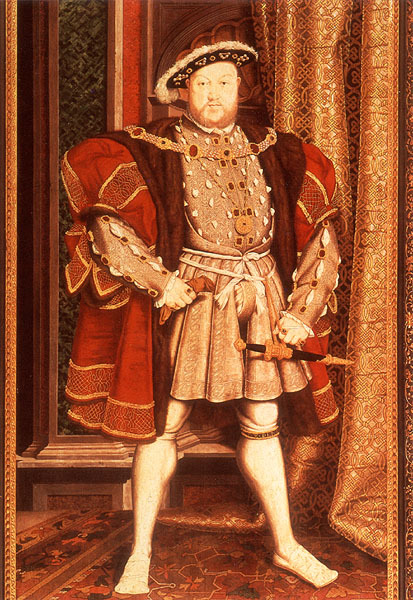 Henry VIII, despite the image of the old, grossly obese tyrant and wife killer most of us retain from our spattering of English history in school, cut quite a dashing figure in his youth. Six feet tall, handsome, athletic, charming, intelligent and well educated, he was a lady killer (please pardon the pun) in every sense of the word. As described by a contemporary, he was “one of the goodliest men that lived in his time, in manners more than a man, most amiable, courteous and benign in gesture unto all persons.” But my oh my, how time, history, and six wives can change even the “goodliest” man. While travelling in England, I have encountered Henry’s looming historical presence wherever I go. Visiting the castles at Hever, the childhood home of Ann Boleyn, and Knole, the Archbishop of Canterbury’s home until Henry conviscated it, I realize that Henry still casts a tall shadow throughout the land. So I thought I would share some of my discoveries. Not everyone knows about Henry VIII’s softer, more humane side. He was a poet, linguist, talented musician, accomplished composer, and a huge patron of the arts. He loved the musicians, acrobats, magicians, and jesters who provided lively entertainment for the court (oddly, not unlike the subjects fellow lady-killer Picasso loved to paint five centuries later). Henry might have joined the Cirque de Soleil had he been born 500 years later. He could play the harp, viola, lute, organ, virginal, fife, and drums, and was a gifted dancer and singer as well, especially skilled in sight singing with his courtiers. What’s not to love in a tall, handsome, talented musician? He certainly must have had his share of court groupies. For more on Henry the musician read this lively blog on Henry VIII: A Machiavellian Musical Monarch. Listen to some musical examples of Henry VIII’s compositions. In the meantime, don’t lose your head over a handsome musician who wields a crown. I didn’t know he was a musician! David is a big fan of The Tutors on Showtime (http://www.sho.com/site/tudors/home.do) and they’ve never depicted him playing an instrument before.